This photo was taken in the park the other day. 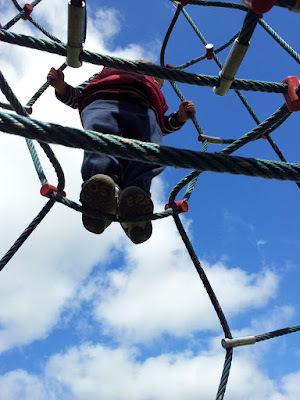 It was the highest my son has ever climbed and my heart was in my mouth as he got higher and higher. He is so active. When he's not on his bike or running down the street, he is copying dance moves whilst watching The Wiggles. The girl doesn't stop either. Nothing is safe since she learnt to climb. She pushes chairs around in order to climb higher! Since she started walking she can't be left anywhere. So this sums up action for me. Climbing.